So many people told me that this was the best Sunnyside event to date, and I have to agree. Thanks for the friendship, the company, the support, and the great entertainment. 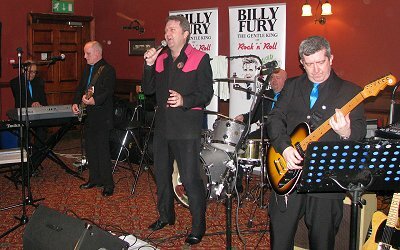 The provisional total raised by our annual weekend at the Sunnyside, Northampton, is £847, which will be forwarded to Alder Hey Children's Hospital, Liverpool. This includes £325 from the Friday and Saturday raffles, £205 from the auction, £72 from the sale of CDs owned by the late Pauline Swindells, and £38 from the sale of Laura's CDs. 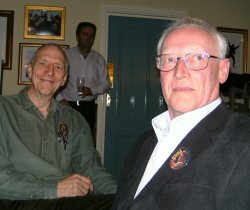 Photographs by John Burke, Mags Cummings, Rob Dee and Maureen Whitehouse. More pics would be appreciated. 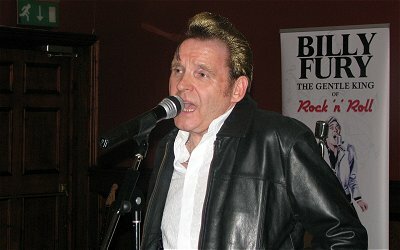 Please email to harry@billyfury.com. Other comments on the weekend are on the message board. If this was the last Sunnyside event, then it was a corker, to end what has been a brilliant ride. 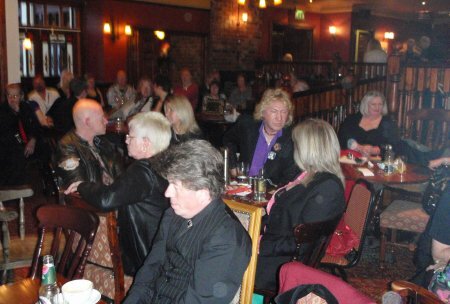 Both Friday and Saturday evenings were packed with some wonderful music, from an array of great artists. Add to that, the friendliest group of people you could imagine, and you’ll get some idea of just what Harry’s Baby has achieved. For Judith and myself, the journey to Northampton was uneventful and our Sat Nav (Gladys) directed us straight to the hotel. 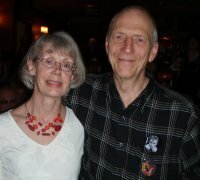 The first people we met were our old friends, John & Mags Cummings, as we tried to sign in for our rooms. The young lady behind the desk couldn’t find either of our names on the booking sheets but a call to the manager soon sorted things out. After a unpacking our case, we ventured back into the hotel to find Rob & Chris Dee, Johnny Storme and his wife, Diane, Henry Swindells, Katie and Alan, and Steven Sinclair, relaxing in the “meeting room”. Rob sang us a couple of songs and then gave the microphone to a new face, who, was introduced as Little Elvis. A few more people turned up to chat, while Rob played us some 60’s music in the background. After a shower and change of clothes, Judith and I ate a hearty meal in the carvery and then returned to a packed meeting room. I can’t remember who was singing when we got there, but we sat in the company of another Alan & his wife, Linda C & Sally, and Kenny & Rita McIntyre. 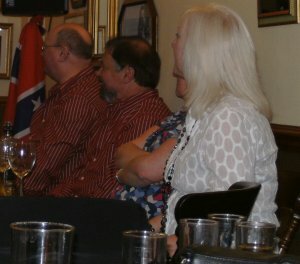 Later we were joined by John Stack and his wife. 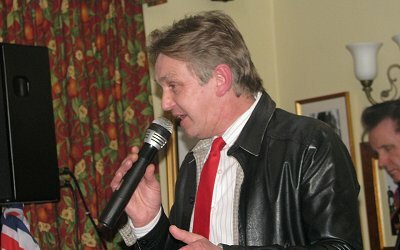 Various people got up to sing a song or two to keep us entertained but, possibly the most memorable was the return of Little Elvis, who sang a never to be forgotten version of the Elvis classic, “One Night”. 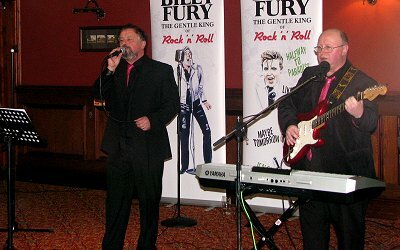 Other new friends to take the stage included Dave Wilcox and Paul Ritchie, both impressing us with their vocals. 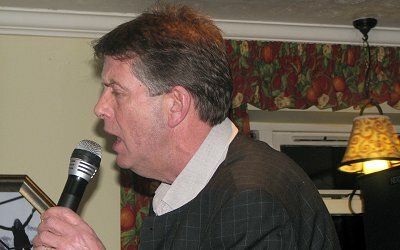 Unlike last year, when my nerves got the better of me, as soon as Rob Dee asked me to sing, I was out of my seat and heading for the microphone. I was going to start off with “24 Hours From Tulsa” but, for whatever reason, I heard myself telling Rob that I was going to sing “I Only Want To Be With You”. That turned out to be a good move because, from the off, I could see people singing and clapping along. 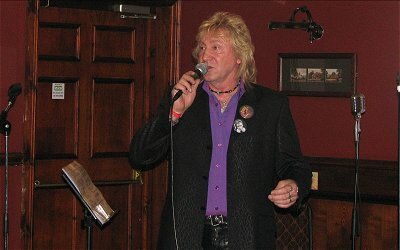 My second song was The Beatles’ hit “All My Loving” and I really enjoyed singing that one. Creeping Bentgrass played quite a number of songs in their inimitable style and towards the end of the night Dean & Jane Hubert sang two great songs together. Saturday greeted us with rain as we made our way across to the hotel for breakfast. There were a few tired people in the hotel lounge that morning, but Harry kept us smiling by providing Sounds of the Sixties on his radio. The main event at the Sunnyside was due to begin at 5pm, but some people were there just after 1pm – obviously wanting to make sure of a good seat. 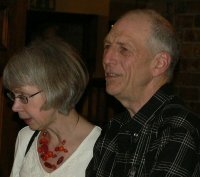 As with the previous night, Cathy and Jean were busy running the raffle, while they were ably assisted by members of the Homan family. 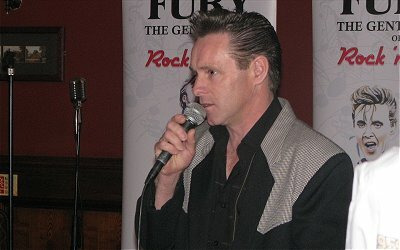 Maureen manned the billyfury.com merchandise table, while both Billy fan clubs sold various related items. 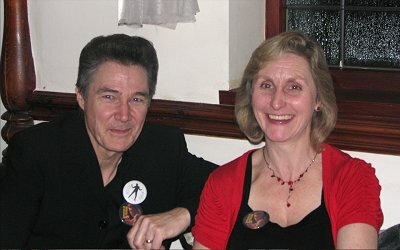 Judith and I arrived a little after 4pm and I began to set up my guitar and music podium. We found good seats, right at the front of the room, along with the McIntyre’s, Lynda C, Sally, and Margaret Dewick. 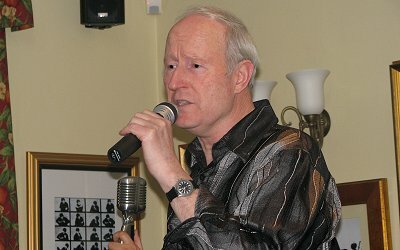 Harry welcomed everyone to the Sunnyside, then it was up to my old friend Dave Jay to compare, and introduce the first act of the night, John Stack. 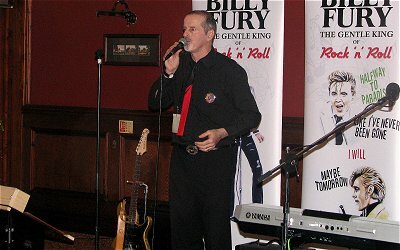 Guitarist, John played a set of lesser known Billy songs, warming the audience up with numbers such as “Am I Blue”. 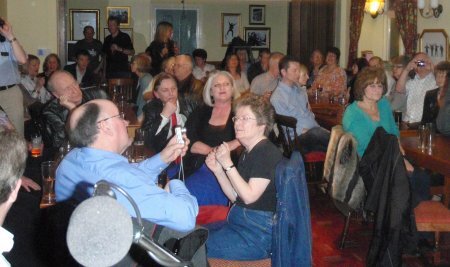 Everyone was, then, surprised as Harry took the microphone again to announce the arrival of a special guest, none other than Billy’s mum, Jean. It, honestly, felt like royalty had arrived. Vic England, had driven Jean from Liverpool to be with us and her arrival brought big smiles to many faces. 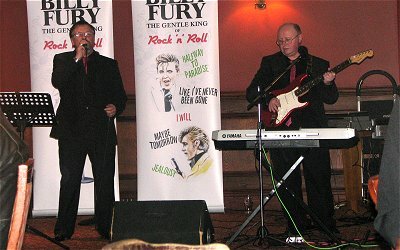 such as “Ferry Cross the Mersey” and “Great Balls of Fire”. Dave Wilcox was next to take to the stage and, although quite nervous, managed to get everyone singing along to his rendition of “Nobody’s Child”. I only met Snowy for the first time last year, but he’s got quite a stage presence. The flowing locks and long dress coat give him quite an appearance. Last year, he rocked things up a bit, but this year, his set was more laid back, with songs such as “Everyday” and “Tell Laura I Love Her”. With Dave Jay managing the artists, and Colin Paul and Rob Dee mastering the sound system, there was time for an extra artist to be added for one song. 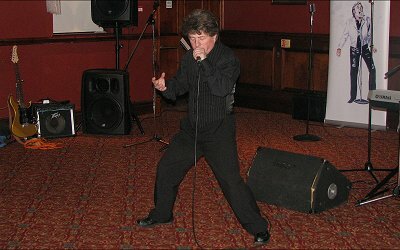 The exuberant Little Elvis (aka Mark) bounded onto the stage to sing his version of “Teddy Bear”. The only way to follow him was with a class act, and that came in the shape of Dean Hubert. 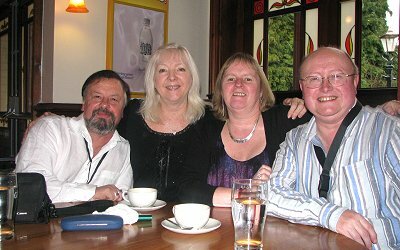 Judith and I met up with Dean and Jane last year, and we’ve kept in contact ever since. 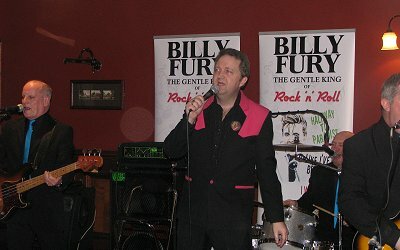 He has a smashing voice and included songs from his Billy show, including “Last Night Was Made For Love” and “I Love How You Love Me”. 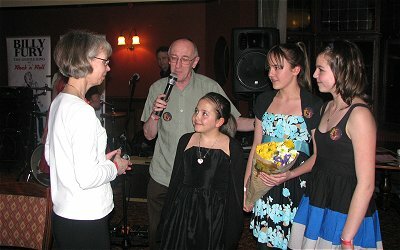 Singing for the first time in five years, was Laura, along with her sister Emily. 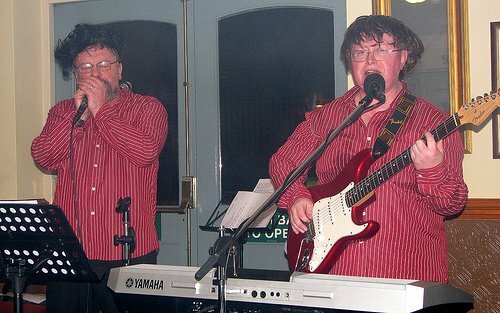 Nervous or not, the twosome soon got back into the swing of things, entertaining us with a medley, plus Shakin’ Stevens’ “Give Me Your Heart Tonight”. 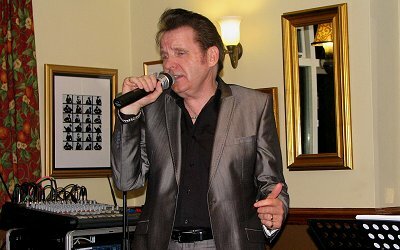 Dave Jay, missed last year’s event, but was back on form this time – not only comparing, but – singing in his laid back style, songs like “Penny Arcade”. Then it was my turn. I tell you, as an artist, there’s nothing better than to see the audience singing along with you, and that’s just what happened with “When My Little Girl Is Smiling”. 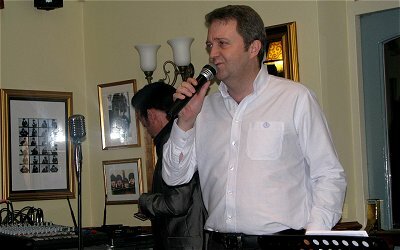 That gave me a lot of confidence and, by the time I was singing my last song, “Daydream Believer”, I was having a ball. Thanks to everyone who spoke to me afterwards commenting on my performance. Dave and John, aka Creeping Bentgrass, took to the stage after me, and treated us to some more hits from the sixties, such as “Every Time You Walk Into the Room” and “The Night Has a Thousand Eyes”. The duo have a real easy listening style, and compliment each other well. 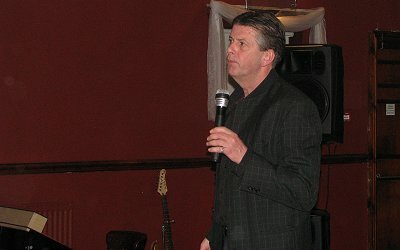 That meant, the final act before the raffle and auction was Rob Dee – Mr Tribute Himself. I’ve known Rob for seven years now and a nicer fellow you couldn’t wish to meet. 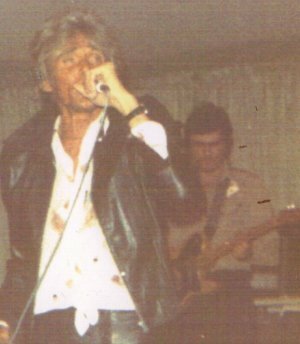 When he goes on stage, his personality comes through with ease, and fans of Billy were treated to “Cross My Heart”, “Sleepless Nights”, “Play It Cool”, and “I Think You’re Swell”, to name but a few. he last new artist on this year’s list was Michelle Gibson. 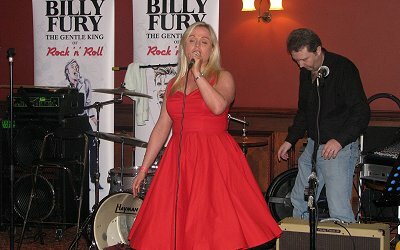 It was nice to hear a female vocalist and, dressed in a lovely red dress, she kept the party mood going with “I’m Hurt” and “Speak to Me Pretty”. 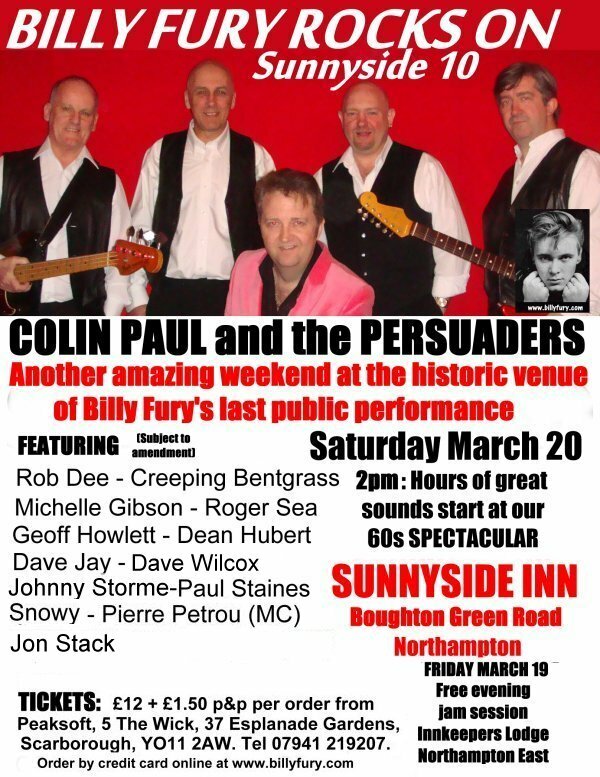 And, so, it was time for Colin Paul and the Persuaders to come to the stage and play. 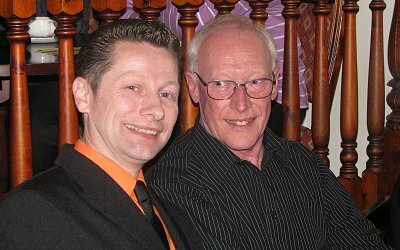 Like Rob Dee, I’d first met Colin at Newark in 2003. Because I’d previously seen him on stage in Blackpool a couple of years earlier I was a little in awe of him but, within five minutes of meeting him, he made me feel right at home. Colin and the band are superb at what they do. Each musician knows exactly what they’re doing and provided the perfect backing to Colin’s vocals. I’m not sure how many songs they sang but they had people dancing from very early on with their set of rock n roll numbers. During the break, Billy’s mum had been presented with some flowers and she was very moved as she told us how delighted she was to be with us all. 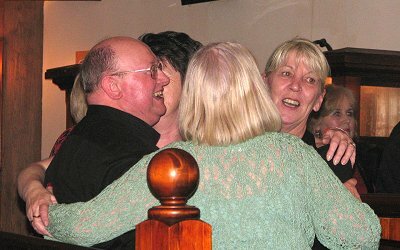 Those gathered were even more delighted when, at Colin’s request, Jean joined him on stage to sing “In Thoughts Of You”. It was a very moving occasion and I’m sure that there were a few tears being shed in the audience. 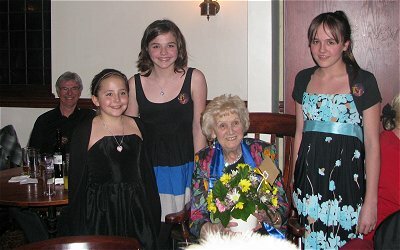 And, just to round things off, everyone joined in to sing “Happy Birthday” to Jean who was 89 on the 25th. To all the artists I’ve had the pleasure of performing with over the years, it’s been great. To all the friends we’ve made, thank you for being such good friends. To Harry, thank you for making it all possible. And to Maureen……thank you for supporting Harry. Behind every man…….. Here’s to the next time, whenever, wherever. Congratulations once again and thank you Harry for a superb weekend. Those who sadly couldn't make it really missed out. 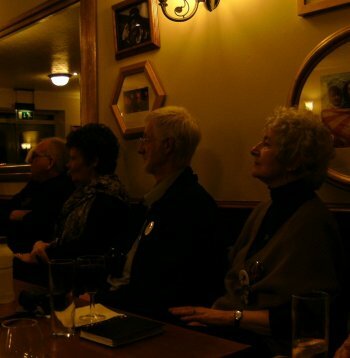 The Friday night at The Innkeepers Lodge was memorable - just like one big family get together with some excellent artists who all entered into the spirit of the occasion. The Saturday show exceeded all expectations. All the artists contributed superbly - Colin Paul's new line up was absolutely superb & Rob Dee just gets better and better. 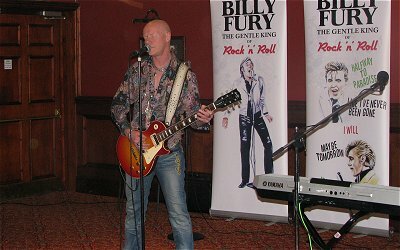 It is fair to say that most artists in clubland are influenced by Elvis and when they perform Billy tracks you can hear that influence. 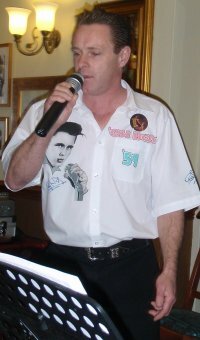 However, Rob is first and foremost a Billy fan and sings Billy's songs without the Elvis overtones - well done Rob! For my part it was such a relief that Laura (with kid sister Emily) managed to perform so superbly after 5 years absence. They put all of the harmonies together by themselves without any input whatsoever from me. Laura has had such a bad time with ill health and really deserves for things to improve. Thank you to everyone who gave Laura & Emily such a warm reception. We bundled keyboard, guitar, bag of cables, microphone stands into the car boot and then took it all out again to get the suitcase in before setting off to pick up David and Jeannie. All the stuff had to come out again whilst we rearranged the jigsaw in the boot and then we were off, throwing money with wild abandon and using the M6 toll road to save a bit of time, then stopping at the services to use it up again... The sandwiches we had brought from home went down better with a few chips and then we were off again towards Northampton. One of the first people we met was Dave Jay. We'd spoken on the phone many moons ago but it was the first time we'd met. We found a few people in the function room, but Harry was getting nervous as Rob was running late and couldn't be contacted. He needn't have worried as Rob and Chris had been sitting in the car listening to a horse called "A Thousand Stars" romping home at 20 to 1!!! "I should have had money on it!" said Rob. 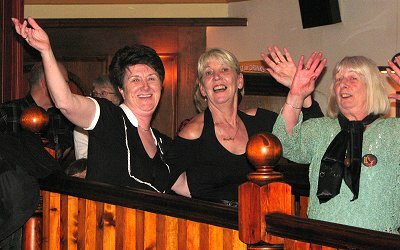 We set up the gear and played a couple of songs to practice then Miss Franny and Jeannie firmly grasped our ears and led us off to the restaurant. Fed and watered we changed, David and I into matching red shirts. "We look like we've had the operation to separate us and are too tight to buy new shirts..." I said. We played a somewhat eclectic mix... I'd bet no-one has ever played Justin Hayward's Forever Autumn at Sunnyside before but it seemed to go down well! Then we got into a run of Billy songs, When Will You Say I Love You, Like I've Never Been Gone, Somebody Else's Girl, A Thousand Stars, King For Tonight, and the first public airing of a new arrangement of I'm Lost Without You. At some point Rob Dee slapped a couple of wigs on our heads. By heck, I came over all nostalgic... Looking at the photos we look complete prats, but perhaps that's an improvement! The following day we were at Sunnyside early and had lunch there. Very good it was too. We set up the gear, did a sound check and then sat down to enjoy the singers. Harry dropped the wonderful bombshell that Jean Wycherley was here. We all stood to welcome here. Paul Ritchie had the unenviable task of singing in front of her first, but handled it with what appeared to be ease and confidence. 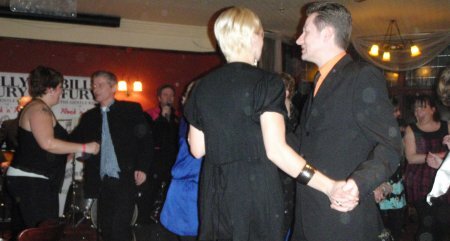 There wasn't a single ropey act that evening and we were following Geoff Howlett so we knew we had to be good. Well, perhaps next year then... We played 4 Billys and a couple of other songs, David cracked a joke about The Night Has 1000 Eyes being about speed cameras. Well that's because late one night we were coming home from a gig at which he'd drunk a fair amount of liquid and I had to stop so he could relieve himself at the side of the road. I stopped next to a gatso and was dying for a speeding car to come past but... alas. Heh heh! 6 songs, 20 minutes, it is amazing how fast that goes. We came off and enjoyed the last few acts. 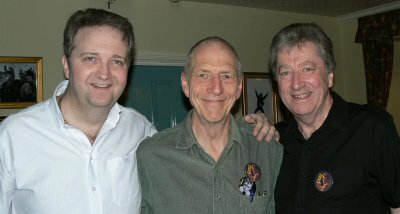 What a superb headlining act in Colin Paul and The Persuaders. Total class. Jean sang In Thoughts of You, Jean Todd, Cathy and Jan grabbed me for a dance. We had an absolute ball. Have I already said this? A brilliant weekend with friends old and new and some excellent entertainment. [joe peden - guitar. chris evans - bass. 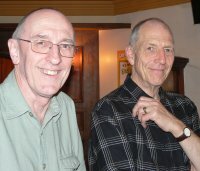 dave lea - keyboards and peter thomas drums. for a great true sound. 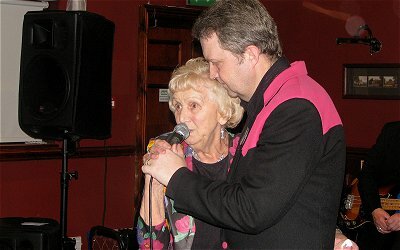 i think the highlight for me was when i invited jean up to sing a duet on in thoughts of you. she kindly agreed. 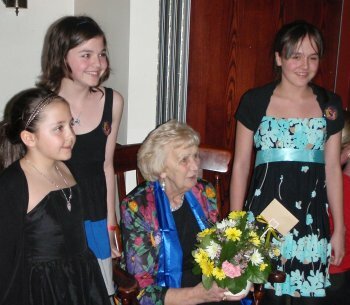 [happy birthday for yesterday jean from all of us x] when she started to sing i just left her to it. as i said on the night. we now know where billy got his voice from. fantastic. it was only fitting that i dedicated 'thats alright mama' to her as billy did when they were both last here. 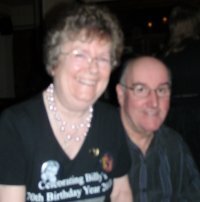 we dedicated a song [helpless] for billys brother albie, as he was unable to make it due to ill health. get well soon albie. we miss you. it was decided that the last song [almost the last song] should be halfway to paradise and rightly so. the whole audience and acts were sing along. it was great to see and hear. as the evening came to a close we decided to do a little more. it was a great couple of days and i truly hope we can do this again. 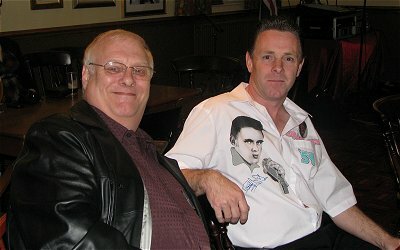 i think as with many billy fury events this is where friends for life are made. ps... if i have missed anybody i am truly sorry and i thank you now. The immediate threat to the Sunnyside has been lifted, as the deal to sell it and develop the site for housing has been abandoned. 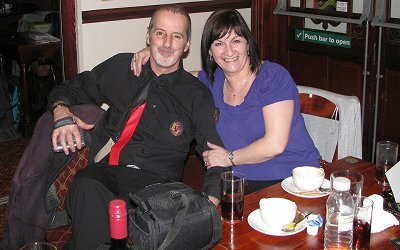 The enthusiastic new manager at the Sunnyside is keen to support us in any way he can. Next year, the large double doors separating the performance area from the main bar will be pulled back for the first time, and in the evening, the bar area will be exclusively for the use of Fury fans. 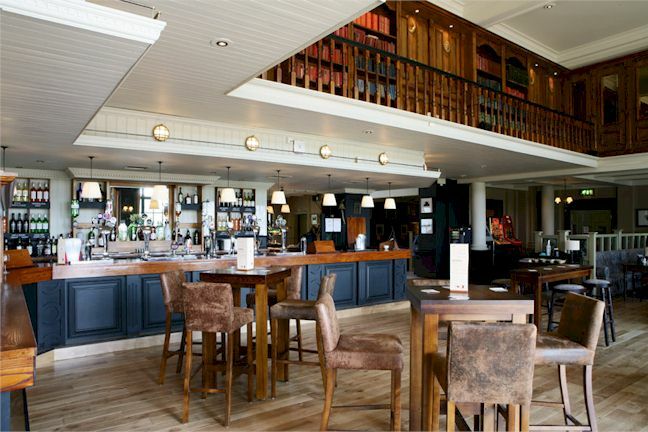 Casual pub-goers will use a reserved area away from our event. This will probably mean that the kitchens will not be in use, and there are plans to provide food from a barbecue. 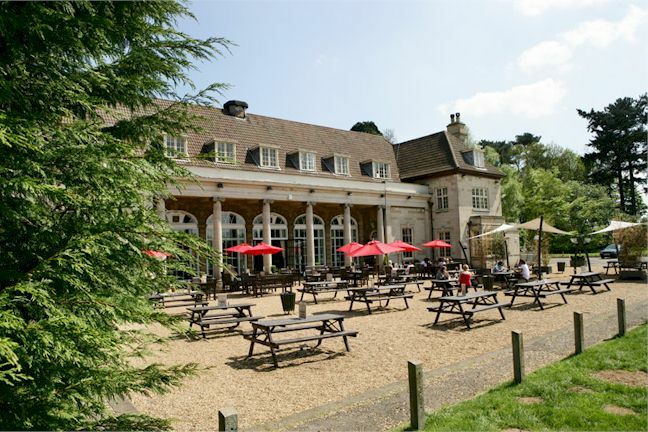 Reservations made for rooms at the Innkeepers Lodge, Northampton East (our main base), for the weekend, and at Innkeepers Lodge, Northampton M1 (our back-up hotel). Anyone reserving a room at the M1 hotel will be on back-up for Northampton East. Other popular hotels in the area are the Travelodge and the Hilton. 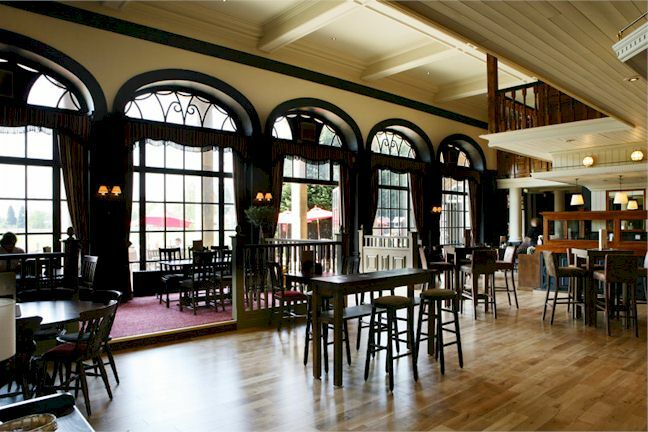 Room rate (bed and breakfast) at the Innkeepers Lodge is £81.65 TOTAL per room for three nights (ie about per night on Friday and Saturday, with Sunday free of charge). 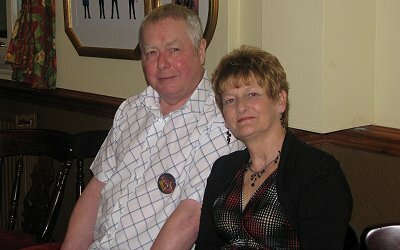 The event will be held at Overstone Manor, the pub now run by the Sunnyside's previous manager, Marie Yates. On Saturday afternoon and evening, Marie will close the pub to anyone except ticket holders, so we will have it entirely to ourselves. 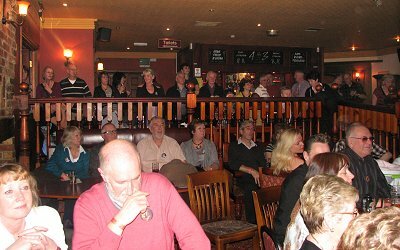 We have block-booked the rooms at the Innkeepers Lodge, Northampton East, where the Friday night session will again be held. The total cost will be £81.65 per room for three nights' bed and breakfast. 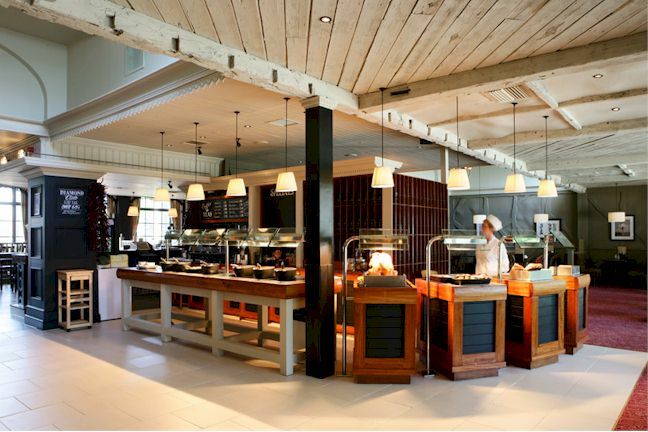 An evening carvery meal currently costs £5-£7.50, depending on when you are seated. The rate includes a free stay on Sunday night, so there is no discount if you choose to stay only for two nights. There are 31 rooms at the Northampton East site, of which all are currently reserved. I am now taking bookings for the hotel's sister site in Northampton, and anyone who books for that location will be on standby for Northampton East, if they wish. Please email me if you wish to reserve a room. You need make no payment now, but rooms will be reserved only for those who buy show tickets. The Hilton Hotel in Northampton currently has a very good deal, and the Travelodge is always in demand because of its very low rates.